There are not enough problems to panic just yet, but there are plenty of areas that need improving. The Seahawks will be in a world of trouble if they don’t improve. 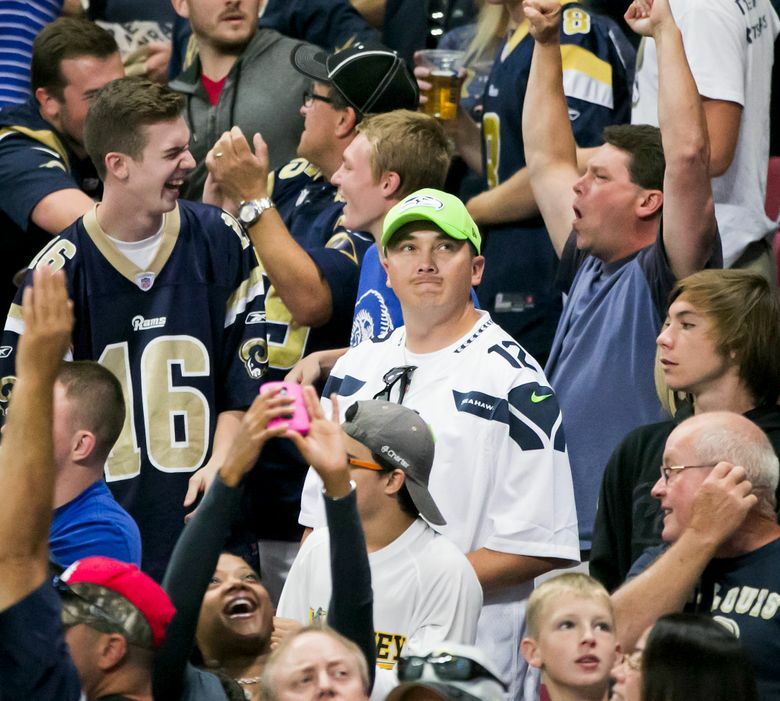 ST. LOUIS — The Seahawks received a message after their season-opening defeat Sunday. It was from reality. And it said they have a long way to go. The message explained that as talented as these back-to-back Super Bowl participants might be, there are as many blemishes as there are boons. It made clear that a world championship is still a reasonable expectation, but that they’ll be in a world of trouble if they don’t improve. So what happens now with Kam Chancellor? Mental mistakes were abundant. There were some physical shortcomings, too. Is the sky in Seattle falling? No. But if some of these issues linger, it won’t be the limit, either. The most glaring deficiency in the Hawks’ 34-31 overtime loss Sunday was their tenuous offensive line. Perhaps it’s unfair to blast a group that lined up against the best defensive front in football (Clayton Kershaw makes a lot of great hitters look silly), but this performance was particularly uninspired. The Rams sacked Russell Wilson six times and once hurried him into an interception. 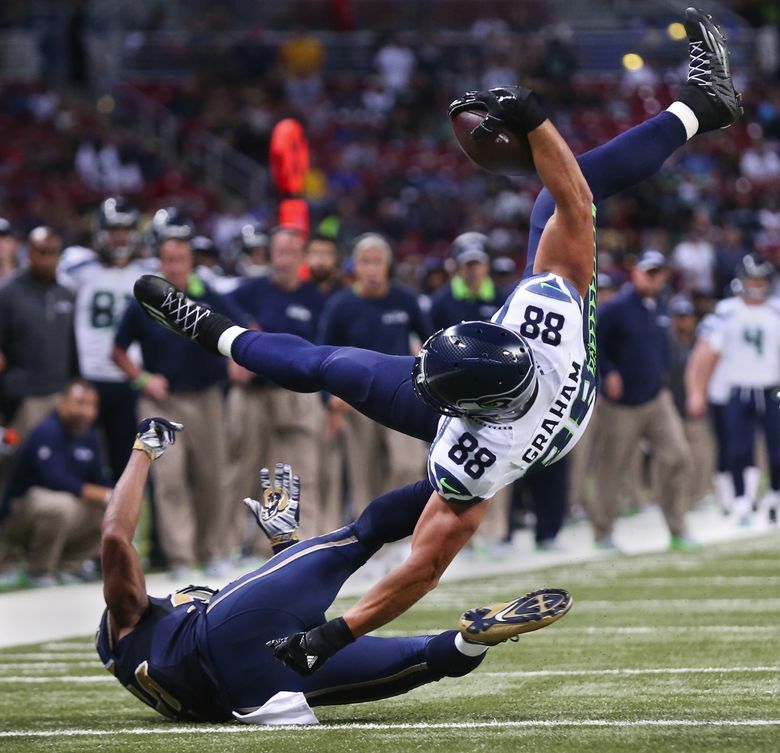 True, Seattle’s blocking was better in the second half — but that tends to happen when it can’t get much worse. Despite the defeat, Pro Bowl left tackle Russell Okung spoke optimistically about the young O-line’s future. But he also acknowledged that the group missing key plays might be why the Seahawks are 0-1. Even so, harping on the pass protection when the other team scored 34 points is a study in shortsightedness. Seattle was equally shaky on defense, giving up 276 net passing yards and 352 total. Sometimes, it was linebacker Bobby Wagner getting sucked up on a 16-yard touchdown run by St. Louis running back Tavon Austin. Other times, it was tight end Jared Cook reeling in a 30-yard pass from Rams quarterback Nick Foles with no defender in sight. Toward the end of regulation, it was Seahawks strong safety Dion Bailey slipping as Lance Kendricks caught a 37-yard tying touchdown pass. And because reality is the theme here, let’s be real — Seattle needs Kam Chancellor back. That was by no means an endorsement of the strong safety’s holdout. If anything, it is a condemnation of a three-time Pro Bowler putting his financial desires ahead of his teammates. Still, while the Edward Jones Dome is a notoriously quiet stadium, you get the feeling the volume would have doubled had Chancellor’s agent been in the building. True enough. Although Carroll didn’t necessarily help. At least not at the end he didn’t. 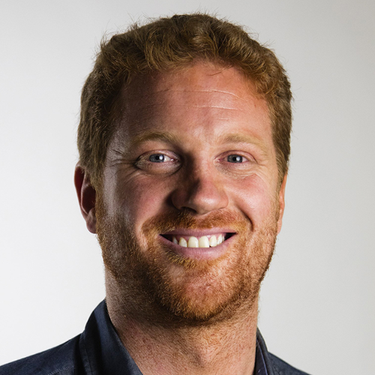 We learned after the game that Seattle kicker Steven Hauschka was not, in fact, attempting an onside kick as it had first appeared. It was simply a blotched bloop meant to travel to the 15-yard line or so. Carroll doesn’t deserve too harsh a rebuke for that call, but still … why deviate from the norm at that juncture of the game? Granted, the Hawks fell victim to Austin’s 75-yard punt return for a touchdown in the third quarter, but before that point, kickoffs hadn’t been a problem at all. 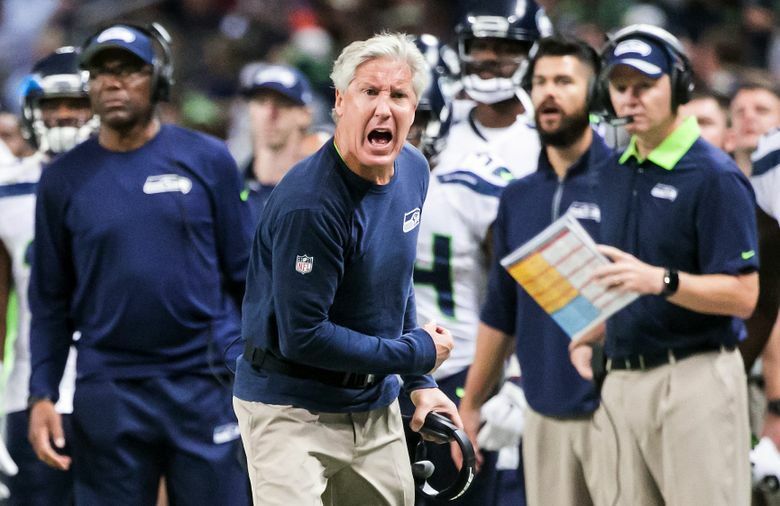 Look, there is plenty to be pumped up about when it comes to the Seahawks this year. 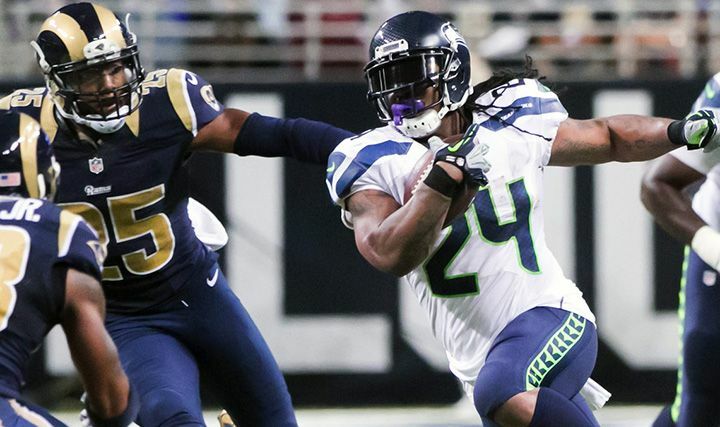 Marshawn Lynch dragged about eight Rams with him during a 10-yard run on the opening drive. Tyler Lockett exploded for a 57-yard touchdown on the next possession, marking the first time Seattle had scored on a punt return in eight years. Earl Thomas delivered a rib-rattling blow to Isaiah Pead in the fourth quarter to force a fumble, Jimmy Graham caught a TD pass in his Hawks debut, and Cary Williams popped the ball out of Foles’ grasp on a blitz en route to the go-ahead touchdown. But for now, so little to celebrate. After the game, the Seahawks’ locker room was surprisingly composed. No real sense of anguish, and definitely no sense of panic. It’s not. Except that on Sunday, they’ll be in Green Bay taking on the Packers, the Las Vegas favorite at this point. The Seahawks have a lot to shore up if they want to win that game. Because if they don’t, they’ll fall to 0-2. And for this team, that would be different. Very much so.